Super-powered nightlight! Get closer to the action with your favorite Avengers super hero with this Marvel Iron Man Mask 3D Nightlight. 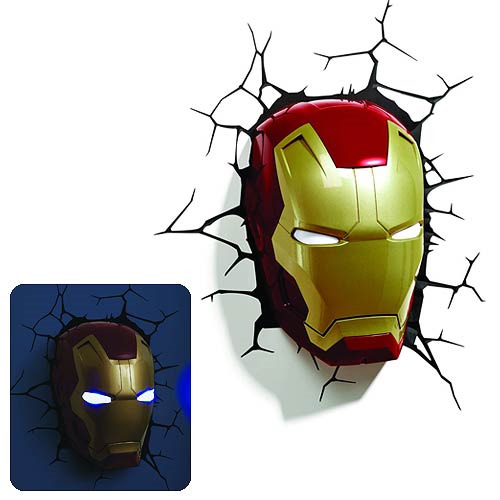 The Iron Man Mask 3D Nightlight is battery operated and includes the 3D crack sticker to give the appearance that Iron Man's Mask has smashed through your wall! The Iron Man Mask 3D Nightlight is battery operated by 3x "AA" batteries (sold separately) and uses LED bulbs. Measures 11-inches tall x 6 1/2-inches wide x 6-inches long and is made of plastic. For ages 12 and up.